A short one today, and a sad one. I heard last night on Twitter that Jack McIntosh has died at the age of 92. It would be hard to overstate what an inspiration he’s been to me. As a professional in a non-palaeo field who went on to do crucial work in sauropod palaeontology, he blazed a trail that I have tried in my small way to follow. I think it’s true to say that, without his example, I would never have got into palaeo research — never even considered it a possibility. 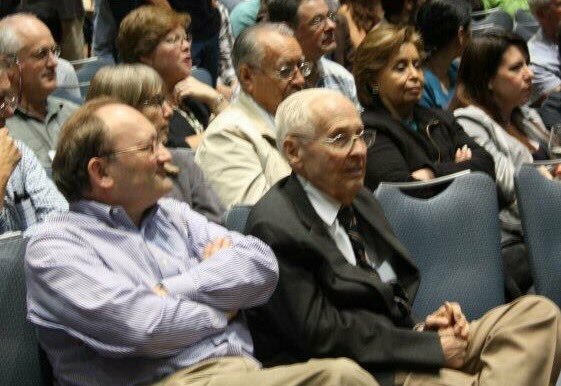 Jack McIntosh, still going strong at a conference late in life. Picture from this tweet by ReBecca Hunt-Foster. Hans-Dieter Sues for scale. Others have written more about McIntosh’s crucial work — for example, determining the correct skull skull for Apatosaurus (McIntosh and Berman 1975), his careful historical work in collections (McIntosh 1981), his detailed monographic descriptions (e.g. McIntosh et al. 1996) and most recently his re-evaluation of Barosaurus (McIntosh 2005). When I made my own start in palaeo, around 2000, his chapter in The Dinosauria (McIntosh 1990) was the definitive overview of the sauropods. Perhaps the best overview of his life and work is the interview that Jeff Wilson and Kristi Curry Rogers conducted with him for the afterword of the volume that they edited in his honour in 2005 (Wilson and Curry Rogers 2005). It’s well worth reading. I’ll close with my own brief experience of meeting Jack, a privilege that I had only once. It was the 2007 SVP meeting in Austin, Texas. I somehow got invited to a sauropod workers’ lunch one day. By careful manoeuvring, I managed to sit myself next to Jack. At that stage I had two very minor papers to my name — the 2005 note on the phylogenetic taxonomy of diplodocoids and the 2006 Mesozoic Terrestrial Ecosystems short-paper on dinosaur diversity. In short, I was a nobody. But Jack was fascinated by what I was working on. At that time, the Xenoposeidon paper was in press — no-one had seen it but Darren (my co-author), the handling editor and three peer-reviewers. I sketched the holotype dorsal vertebra — literally on a napkin, if I remember rightly — and explained all the unique features. At this point, Jack was 84 years old and could certainly have been forgiven for just wanting to have his lunch in peace, but he was deeply interested. Even at the time I was aware of the honour of showing this work to a man who’d been at the forefront of my field for four decades. I don’t remember whether we discussed it at the time, but I’d spent the previous week, with Matt, Randy Irmis and Sarah Werning, in the collections at the Sam Noble Oklahoma Museum of Natural History, working on the remains of a sauropod from the Hotel Mesa quarry in the Cedar Mountain Formation. When the paper finally came out four years later (Taylor, Wedel and Cifelli 2007), we named the new dinosaur Brontomerus mcintoshi in Jack’s honour. Very nearly but not quite a year earlier, Chure et al. (2010) had beat us to the punch by naming their brachiosaurid Abydosaurus mcintoshi after him. To the best of my knowledge, that makes Jack the only person in history to have had two sauropods named after him in a year. A fitting tribute indeed. Jeff Wilson has written a piece that goes into much more detail about McIntosh’s scientific achievements. Well worth a read. McIntosh, John S. 1981. Annotated catalogue of the dinosaurs (Reptilia, Archosauria) in the collections of Carnegie Museum of Natural History. Bulletin of the Carnegie Museum 18:1-67. McIntosh, John S. 2005. The Genus Barosaurus Marsh (Sauropoda, Diplodocidae). pp. 38-77 in Virginia Tidwell and Ken Carpenter (eds. ), Thunder Lizards: the Sauropodomorph Dinosaurs. Indiana University Press, Bloomington, Indiana. 495 pp. McIntosh, John S., and David, S. Berman. 1975. Description of the palate and lower jaw of the sauropod dinosaur Diplodocus (Reptilia: Saurischia) with remarks on the nature of the skull of Apatosaurus. Journal of Paleontology 49(1):187-199. McIntosh, John S., Wade E. Miller, Kenneth L. Stadtman and David D. Gillette. 1996. 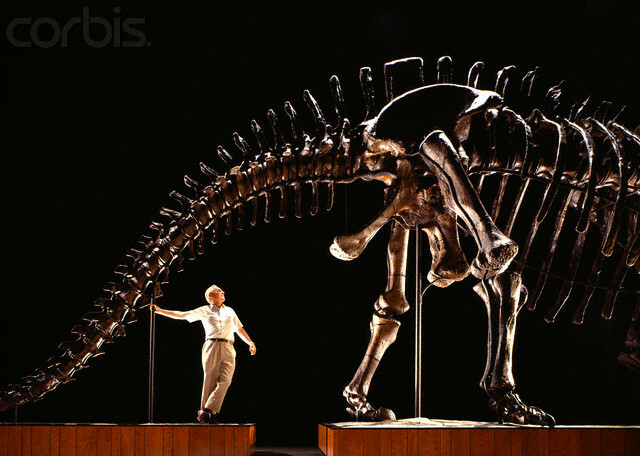 The osteology of Camarasaurus lewisi (Jensen, 1988). BYU Geolgy Studies 41:73-115. Wilson, Jeffrey A., and Kristina A. Curry Rogers. 2005. A conversation with Jack McIntosh. pp. 327-333 in: Kristina A. Curry Rogers and Jeffrey A. Wilson (eds. ), The Sauropods: Evolution and Paleobiology, University of California Press, Berkeley, Los Angeles and London. 349 pages.